Photoshop gives you the option of the layers of export and saving like various files using a great choice of formats including PSD, BMP, JPEG, pdf, Targa, tiff, and png. By exporting layers towards files, a format is applied to all the exported layers. 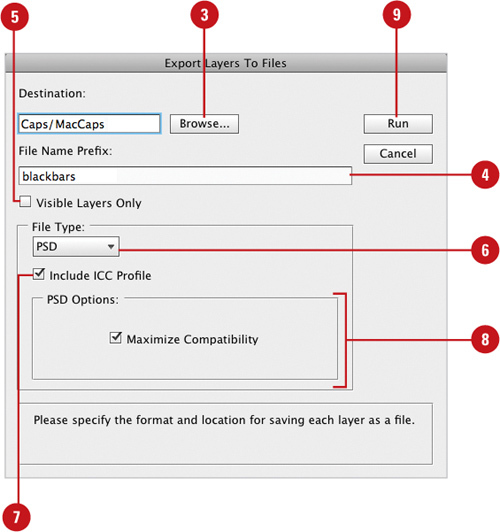 The layers of export to the ordering of manuscript of files gives you the capacity to create various files of the various layers and the selected options specific to the format of file which you want. 2. Click the File menu, point to Scripts, and then click Export Layers to Files. 3. To specify a destination for the files, click Browse, and then select a folder location. 4. Enter the name you want at the beginning of the files. 5. To export only visible layers, click the Visible Layers Only check box. 6. Click the File Type list arrow, and then select an output option: PSD, BMP, JPEG, PDF, Targa, TIFF, PNG-8, or PNG-24. 7. To embed a color profile, select the Include ICC Profile check box. 8. Specify the options you want that relate to the selected file format. 10. Upon completion, click OK. The files are named with the prefix you specified and numbered in sequential order.